This is my bare block prepared for the CQI Beaded RR #2. This is the first round robin I have gone in for almost a year because of time constraints so I am really looking forward to it! There are some wonderful stitchers in it with me: Rebecca, Clairee, Gerry and Simona. I have admired photos of their work and now I will get to see it in person! I can't wait! I'll post pictures as the block progresses. This week saw another project done - I must be on a roll! 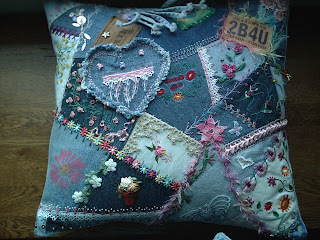 This is a crazy quilt pillow for dd, done in denims. It was started in a round robin when she was in Brazil as an exchange student. I was missing her terribly and my online friends were so supportive and we all poured lots of love into this. I gave it to dd yesterday and she was very happy it was done. Thank you to everyone who stitched on it! The two leather labels were added strategically to cover holes in my piecing as was the frayed denim heart I made and added. I had to add the bit of denim fringe on the top because it was so fun and funky and decided to print a silkie of the flag of Brazil and tuck it beneath the fringe. 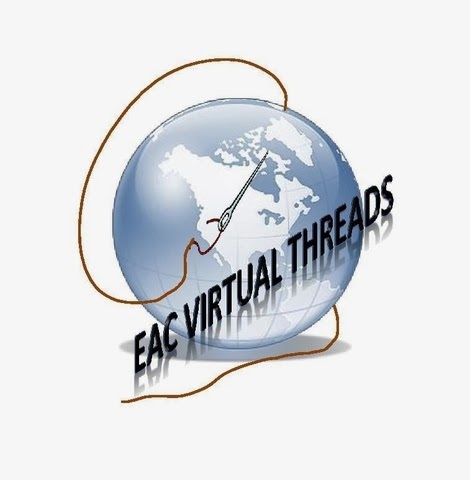 My talented friends added beautiful Brazilian embroidery during the round robin phase - a special thanks to Shari for her talents here! With the denim it was possible to add some larger braids, beads, etc. 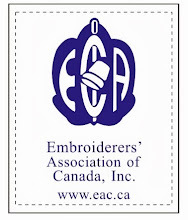 that I wouldn't ordinarily use on cq and combining them with the fine embroidery made the whole piece fun. 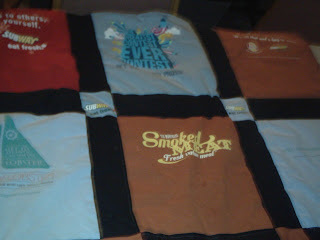 First I cut out the fronts and backs (which have graphics as well) of the t-shirts in 16" squares. I put a light weight, non-woven fusible interfacing on the backs which stabilized everything really well and made them very easy to work with. The small corner blocks are done the same way with the little logos on the sleeves of the t-shirts. The sashings were 100% cotton - I used black in order to try to make the other colours "pop". For the back I was able to use a powder blue cotton sheet and because of time constraints (dd gave me a week!) I didn't use a binding but instead sewed it together like a pillowcase and then turned it right way out again and used an invisible hand stitch to close up the space left for turning. 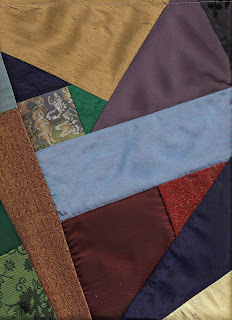 I used leftover quilt batt inside and put a few lines of quilting on it and it was done! She took it to the party and her boss was very surprised and pleased. Since I enjoyed making this so much I am now wondering if my sister would part with some of her t-shirts (she runs marathons) so I could make one for her! 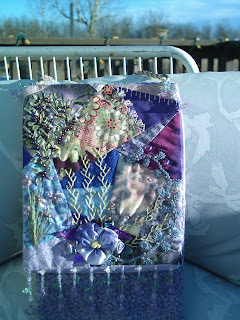 In January, 2005, CQI had an online class available to its members on how to make this crazy quilt Pansy Pouch. Peggy White of Kalico Kottage taught the class and I enjoyed it immensely. Since I am currently working on a couple projects that are the "not to show until after its over" type, I thought when I had this out today that I might share it instead. It remains one of my favourite pieces of cq. Peggy taught us that we could be a little less traditional and did not need to have every seam embellished but that it was enjoyable to meander here and there with our feather stitches, etc.